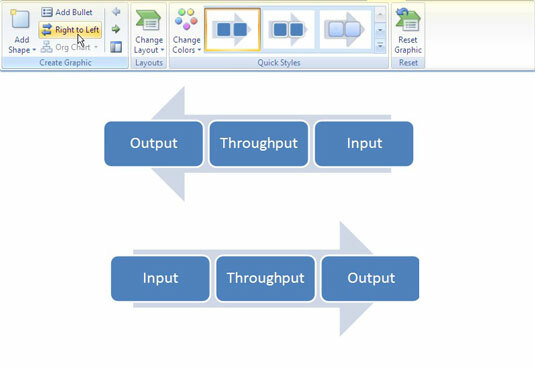 If your PowerPoint diagram is horizontally oriented, you can flip it over so that the rightmost shape in your diagram becomes the leftmost shape, and vice versa. 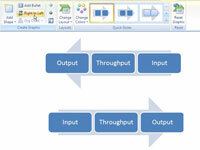 If there are arrows in your diagram, PowerPoint changes the arrows to point the opposite direction after you flip it. You can’t flip vertically oriented diagrams this way. Clicking anywhere on the diagram should select it. 2Select the (SmartArt Tools) Design tab. The Design tab pops up. 3Click the Right to Left button. The Right-to Left button is located on the Ribbon in the Create Graphics section. If you don’t like what you see, click the button again or click the Undo button. If you don’t like what you see, click the button again or click the Undo button.